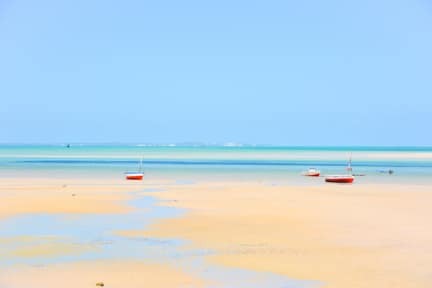 Baobab Beach is situated directly on the beach and just a kilometer from the colorful central market in Vilanculos, Mozambique. Baobab Beach looks out over the azure seas and shifting sands of the Sunrise from BaobabBazaruto Archipelago. 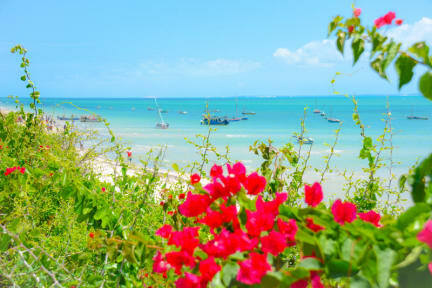 Baobab Beach is well located directly on a white sandy beach overlooking the islands of the Archipelago of Bazaruto. The town center is just 10 minute walking. Baobab Beach facilities include accommodation, restaurant, bar, communial kitchen, communal ablutions and transport to buses. Accommodation consists of beachfront chalets (shower en-suite), ethnic huts, dormitories, camping and overlander sites. Baobab Beach activities in the area include a diving, snorkeling, island hops, dhow trips, horse riding, fishing and village tours. Check in time stats at 12:00 to 22:00 . Check out time is 10:00 . -Earliest check out: any time if they pay the day before. Clients can leave also in the night presenting the pass to the guard. Bonne auberge et bon staff. Par contre les douches de dehors ne sont pas très propres, l'eau sort jaune/orangée. Il est préférable de se doucher dans le dortoir.